We've observed before that there's no real difference between cyclists and the owners of fast german cars: Arrogant and Self-entitled wankers: the only variable being how much kinetic energy they bring to a collision. You can see that some of the individuals are in fact self-aware of this little detail. And rather than treat "the opposing team" as unworthy, instead welcome their presence and greet each other as they pass. Here we can see exactly this at work, with our tax dodging adult and teenage child heading towards the Clifton "dead zone" from the more exciting parts of the city, on a weekend afternoon where almost nobody is around. This St Pauls Road, incidentally, because its the way from Clifton to those more exciting parts of the city. It continues as "Tyndall's Park Road", because the Bearpit roundabout wasn't considered in the victorian era destination, so "Bearpit Avenue" is eternally denied our city. You can see, as they head down St Pauls Road, a Porsche turning in from Whiteladies Road, cutting the corner as it revs up to the 20 mph speed limit Marvin Rees is yet to publicly abrogate —though his state of the nation "we can't punish driving" hints that it will come soon. It comes up behind the two cyclists; the father riding alongside the child to stop both of them getting close-passed. Rather than get upset, the Porsche driver pauses for a moment, assesses the situation, and recognises a fellow arrogant and self-entitled wanker. They pass, but close enough they can see each other clearly, and sound a friendly on their horn as they pass. Our cyclist, also recognises a fellow arrogant and self-entitled wanker waves a friendly hello back. After all —why else would someone beep their horn in a quiet Bristol road except to say hello? 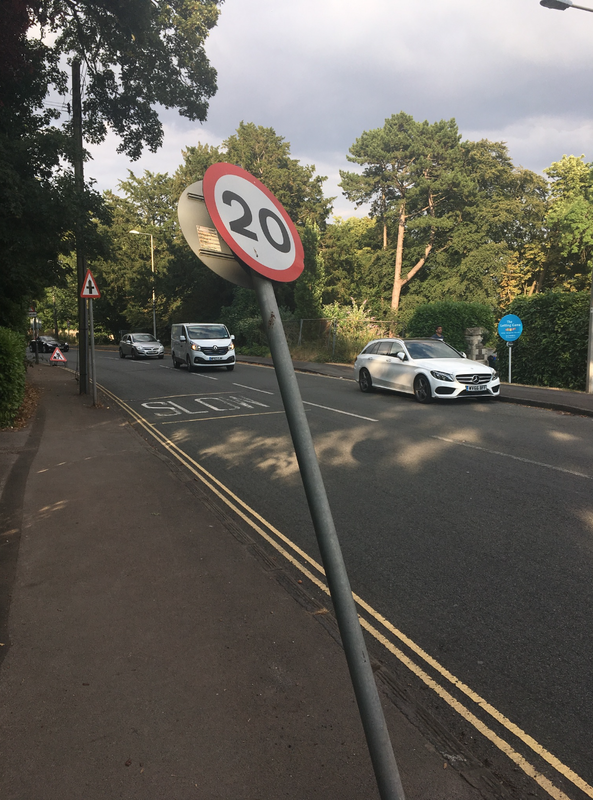 Our mid-august coverage of the 20 mph "firstbus" review, was illustrated with a photograph of a 20 mph sign nonchalantly keeling over. That photo was taken on Bridge Road, the approach to the Clifton Suspension Bridge from North Somerset. If you are driving from Portishead down the 40 mph-limited A369, or sprinted down Beggar Bush Lane from Failand (60 mph), this is the first sign you are entering the Big City where you have to temper your expectations of speed with the need to share the road with people on foot and bike and keep your speed at around 20 mph. More specifically: it's where the sign was. Rather than repair the sign, someone in the "hypothesised" North Somerset Highways Maintenance Department has decided that rather than repair the sign, they'll just take it down and fill in the hole. Which means, for anyone approaching Clifton on this road, there is no large roundel here warning of the speed change. There's one on the other side of the road, but it can be hidden by parked vehicles. As a result: no major cues that you are in a 20 zone. Does it change people's behaviour? Hard to tell. Here's a rear-view clip from earlier in the week of one of tax-dodgers (expendable) approaching the bridge and going past where the sign used to be. They're doing 20-25 mph in the 30 mph zone. If you look at the speed of the car WR07YFL coming up behind, it's probably doing 35-40. 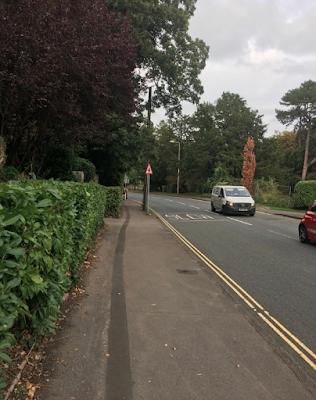 And, as they both cross where the sign used to be, the driver decides she doesn't want to slow down for a bike only doing 25 mph, and instead swing past. Which, given our tax dodger is positioned in the middle of the lane, and there's a lane separator fast approaching, isn't going to work. She eventually slows down and tucks in behind, only getting an option to go forwards when the cyclist pulls over on the "they don't have to pay any-more!" cyclist bypass of the toll gate. And then, the same cyclist pulls out in front and speeds up to 20 mph again, enough to stop the car from overtaking. We've documented dangerous passing on this bridge before; at least here the driver was sensible enough to not attempt it —but we wonder, if it had been an oncoming bike, not a car, would she have done any differently? In town, she drives less aggressively; the cyclist is now "only" doing 20 mph, but so are the cars in front. Seemingly having the reason for the speed constraint being a car, not a bike winds up the driver less. Again though, we have to ask: if it hadn't been for that, would she have made another attempt? Who knows? And one recorded incident doth not a defensible dataset make. For now: if caught driving above the 20 mph limit, anywhere in the inner zone, just say "I came in over the Suspension Bridge and didn't see any signs!" Which, if it works, shows that all it takes is some laziness from an adjacent council for the whole 20 mph project to slowly fail.